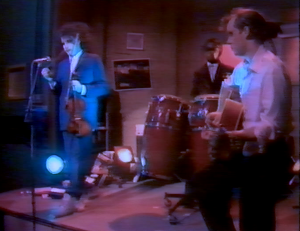 At the end of May 1984, The Cure had almost finished the European leg of the Top Tour. 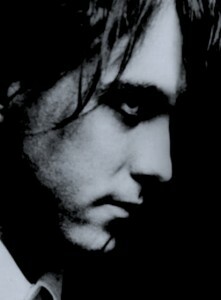 Robert had the prospect of only about one week off (probably planned as rehearsal time) before embarking on a 2,5 week UK tour with Siouxsie & the Banshees again promoting Hyaena, starting with two major dates at the London Brixton Academy on 8 and 9 June 1984, to be followed by a US tour with them in July. Then, during the Autumn he would tour the Pacific and the US again with The Cure. According to The Cure’s biography Ten Imaginary Years, Robert tried to call Steven Severin from Hamburg where The Cure played on 26 May 1984. Robert got Steven’s answering machine and left several messages saying he couldn’t make the Banshees upcoming tour. The Cure did one more show in Berlin on the next day, 27 May. Then Robert took a plane back to England, officially to meet the Banshees and discuss the situation. But instead he visited the Smith family doctor, which probably must have been on 28 May. Robert: ‘I walked in, and it was one of those moments where someone’s face just falls. He didn’t have to say anything. He then told me, “Whatever it is you’re doing, you have to stop”. He gave me a note, which I gave to the Banshees’ insurer, that basically said, “This man can’t walk, let alone tour.”’ (from Mark Paytress’ Siouxsie & the Banshees Authorised Biography). Contrary to the doctor’s advice, Robert decided he still wanted to do the final three Dutch shows of the Top Tour, so he travelled back to the Netherlands. The original tour schedule mentioned two shows at the Muziekcentrum Vredenburg in Utrecht on 29 and 30 May as the last two dates of the European Top Tour. 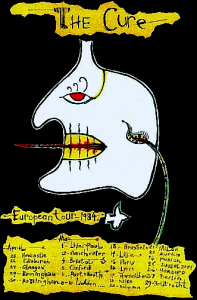 But while on tour The Cure were asked as headliner for the Eindexamen Festival at De Maaspoort in Den Bosch (a more simple name for ‘s-Hertogenbosch) on 30 May, so they chose to play there instead on that date. As the first date in Utrecht on 29 May sold out quickly, a second show in Utrecht was added to take place on 31 May 1984. Meanwhile, the press also noticed that Robert was not doing well. Reporter Jeroen Wielaert followed the band around in the Netherlands that week and wrote an article for ‘Stic’, a free monthly Dutch alternative music magazine. Below is a translation of the first part from that article. Slowly Robert Smith moves on, his head pressed between his shoulders. It looks like he is carrying a burden as heavy as lead, while he has to walk on a path seeded with fresh eggs [this is probably a Dutch expression, but you get the point, LF]. With his white shoes without laces, his shirt hanging sloppy under his jacket and his wild hair, he gives an expression that is even well-groomed as worn out. It’s no different on any day that I witness him this week. One thing is clear: it’s impossible to not notice that he is lacking energy. That energy is only present during the concerts of The Cure. However, around those shows, there are so many problems, that there is every reason to be exhausted. The Cure’s stay in the Netherlands is surrounded by chaos, from which it appears it’s no fun to be The Cure. The title of the new LP The Top represents something different than the condition of the group. But the audience is wild, and that’s what matters after all. The trouble starts on the eve of the first concert in Utrecht. Arrangements have been made for interviews and photo shoots at 5 o’clock in the afternoon, but no one from The Cure has turned up yet at that time, leading to the grumpy hanging at the bar, as familiar from other occasions. The band appears to be delayed and their truck full of equipment was involved in a traffic accident. Then, all of a sudden, he’s there. 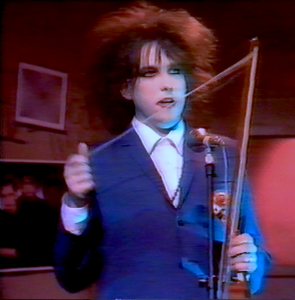 Robert Smith walks in with a drag. Excitement all around if the concert is still going to take place. In the end the equipment arrives far too late; the concert is being cancelled [here is a message from the organization that was distributed on the evening, saying this concert will be postponed until Thursday 31 May afternoon, at 4:30 pm, LF]. Smith is willing to talk for a short while and is kind enough to pose. But he is too depressed to be confronted with extensive interviews. You better spare him, so that’s what we do. The next day at the Amsterdam Sonesta Hotel. Once more the bunch of journalists are biting their lips due to the exceeding of the agreed time. Initially, only Lol Tolhurst descends into the lobby, with whom I sit down at a table. After some minutes also Smith shows up. Crumpled up and ashy pale, as if he hasn’t spent the night in this luxurious hotel, but in a trash bin. ‘Oh Lol, all those people’, he stumbles, ‘I really can’t do this. Could you please do this.’ And so it happens. One has to understand the situation. But it gets pretty annoying when the German manager breaks off the converstation already after ten minutes, announcing that The Cure is being expected in Den Bosch for the KRO Eindexamen Festival. The Eindexamen Festival was especially organised for scholars celebrating their highschool graduation, so the venue was packed with exuberant teenagers. If I’m right the festival took place a couple of times during the eightees, between 1983 and 1988. In 1984 it was held on Wednesday 30 May, the day before Ascension (which is a national holiday in the Netherlands). Apart from The Cure as headliner, there was at least one other Dutch band, the Frank Boeijen Groep. They were very popular at the time and had some huge hits in the Netherlands. Announcing Primary, Robert said something like ‘this will hopefully make up for a lot of that garbage you suffered for the past hour (…)’, presumably referring to their honourable support act. And The Cure launched into their third encore. At the end of the show, after an intense rendition of Forever, Robert said ‘Thank you, goodnight… You were fab…’. Next up was a busy day for The Cure. They were going to do two shows on the same day at the Muziekcentrum Vredenburg in Utrecht. One being the rescheduled concert of 29 May at 4:30 pm and the second was the original extra show, which would start at 10 pm, a bit later than initially planned. The 4:30 pm show has the peculiarity of the only concert ever where The Cure opened with Wailing Wall. They reshuffled the setlist a bit and instead of Bananafishbones they performed Cold, a rare song on this leg of the tour. The 10 pm show was reviewed by music magazine Oor. Below is a translation of that article. A new LP and for the first time in two years a stage appearance. The band is called The Cure, the title of the new LP is The Top and the scene of action is Muziekcentrum Vredenburg. 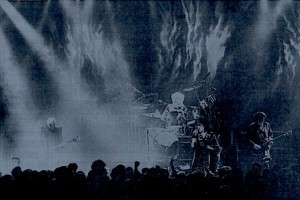 Problems with equipment caused a cancellation of the gig that was first planned on 29 May, with the consequence that four thousand Cure fans were going to see the band during two performances in this music temple on 31 May. Even before the start of those shows fans were frantic with enthusiasm and already at that moment some had to be carried away with a sort of stroke. 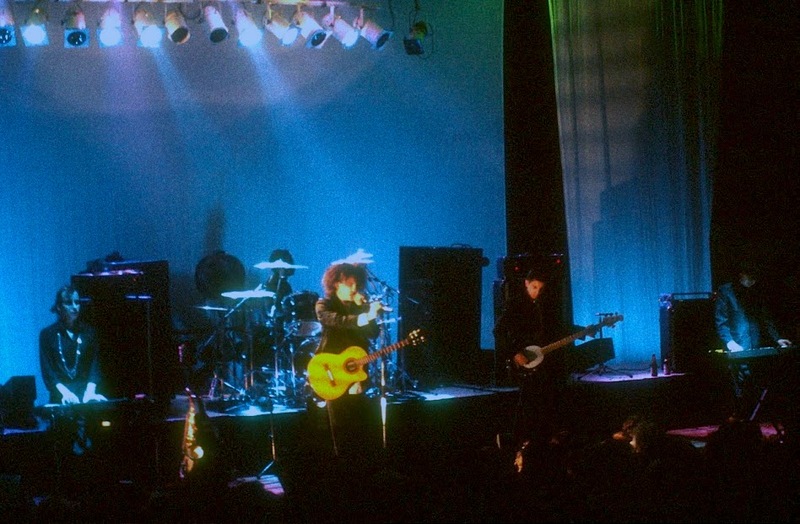 This continued during the concert: hysterical girls who squeezed themselves up against the side of the stage, screaming for ‘their’ Robert, while Robert Smith turned away doubtfully and launched compulsorily into the next song again. The Cure presented themselves as a five piece formation. Lol Tolhurst had turned his back on his drumkit and was now playing keyboards with very simple melodies. Furthermore, there was new drummer, keyboard player/guitarist, bassist and of course band leader singer/guitarist Smith, who couldn’t hide his gloom neither with his words nor his performance. The whole was threatening, the dark vocals and instrumental sounds, the steaming waves of fog, the frightening images of an electric chair on the white screen and the immense light show. But of course a title like The Empty World speaks for itself. For the audience it was a party and the group pandered them by playing songs comprising of almost their entire repertoire: from Three Imaginary Boys to The Top and even cheerful meaningless tunes like The Caterpillar (during Smith’s clumsy violin playing there actually appeared a smile on his face), Lovecats and The Walk were not missing in the set. In spite of the impressive performance which lasted for almost two hours, The Cure intimated too obviously that they were going through the routine. For a long time they haven’t been the alternative band they were at the end of the seventies and I very much regret that. The next week [the week after the three Dutch shows, LF] there is still a spot in the schedule after the recording for Veronica’s Countdown. The happening runs over time enormously. Again we are waiting for The Cure, this time in spite of The Cure. While Alice & Battiato, Roberto Jacketti & The Scooters and Toontje Lager have to perform their trick repeatedly, Robert Smith is killing time playing a video game. The recording of The Cure goes well in one take. When it’s all over, Tolhurst bends over to Smith and crows boyishly: ‘Let’s get gloriously drunk now’. There is a quarter of an hour left for an interview. The Cure took a break for about three months. Thanks to Remco for information about the Eindexamen Festival. Here, here and here you can find some great live photos of Utrecht 1984.